From that point, Foxworthy wrote content for his own game, Relative Insanity! It includes setup cards, like situations that might happen with or around family, and then a bunch of punch line cards that players use to fill in blanks or finish the setup phrase. So, the setup “We were shocked when MeeMaw said to the preacher’s wife…” and maybe you play the punchline card “Do you own a mirror?” or “I need to get my groove on.” It’s a different, laugh-out-loud game each time! 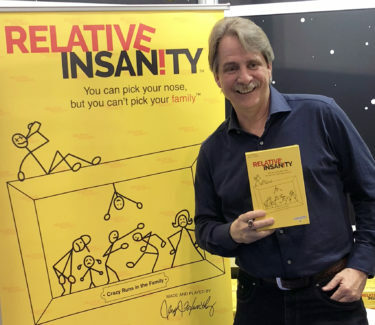 Because Jeff Foxworthy enjoys making people laugh, and has done it professionally for over 30 years, he enjoyed creating this game, and knew it would be a hit when his family played it during the next Thanksgiving gathering. Foxworthy remembered, “The results were beyond anything I could have hoped for. We laughed until we cried and a few people might have even peed… just a little bit.” Consider that a warning to “go” before you play, folks! Foxworthy makes it his mission in life to make more people laugh than anyone on earth, and works hard to take care of his family, including his beautiful wife and daughters. Because, when it boils down to it, he’s just a guy. A guy with great jokes and a big heart. And now, a great game!